This is an archive of our 2014-15 AP CS Class work. You can find the latest class by the AP CS tab at the top. Website links and assignments may vary so some material may be out of date. Check in with Mr. Bergquist if you have any questions. The 2015 AP test was 3 years, 11 months, 11 days ago (Thursday, May 7th, 2015). Hope you did well! Last Day Have a Great Summer! Take some time to relax, you have all worked hard in class. Please fill out our AP CS 2014-15 Class Survey, Let me know if there are any topics you want covered in Projects in CS next year too! I enjoyed trying out all your Final Projects, share them with your family & friends. It's been a great year. Hope you all enjoyed learning about programming. Go forth and program! Keep me posted by email if you have any programming related projects or internships this summer! I'll be checking email periodically. And here's Our Garfield HS Computer Science Linked In Group to join you must have graduated and be over 18 years old. Any ideas on a logo?? Discuss your coding plans for the summer! Full details from SPS here. Instructions: Students should use there username + @seattleschools.org as email, and I believe need to also enter their SPS account password. Want to try building some Apps this summer? Check out: PACC Winner page!! Stay connected with Garfield CS with LinkedIn: please consider filling out this form. Then take a chance to test drive your classmates projects! They are all in our class S:Drive folder. - Please fill out our AP CS 2014-15 Class Survey,especially seniors. Final Project code is due Wednesday, June 10th, and presentations are Thursday, June 11th. Instructions at right! Take turns showing off your project and test drive other's projects to help them find bugs. Please try out at least two other projects and find two people to try your own. More is better and more fun. Still time to sign up to get Tech Prep Credit for this class: Register here for Tech Prep - check with Mr. Bergquist if you think you already have an account. Tuesday: Senior Check Out Day! See you at Graduation and Best of Luck!!! 3) Compile the code in that folder (using JGrasp please) and make sure that it runs fine - you will be executing from here for the demo's on Thursday 6/11. Keep in mind I will be reviewing running & reviewing that code for grading. Check out Bachelor of Application Development degree from North Seattle College, new alternative CS degree. Still time to sign up to get Tech Prep Credit for this class: Register here for Tech Prep - check with Mr. Bergquist if you think you already have an account. Remember, all other Final Project code is due Wednesday, June 10th, and presentations are Thursday, June 11th. After Mr. Bergquist explains, if you want to stay connected with Garfield CS, please consider filling out this form. Thanks. 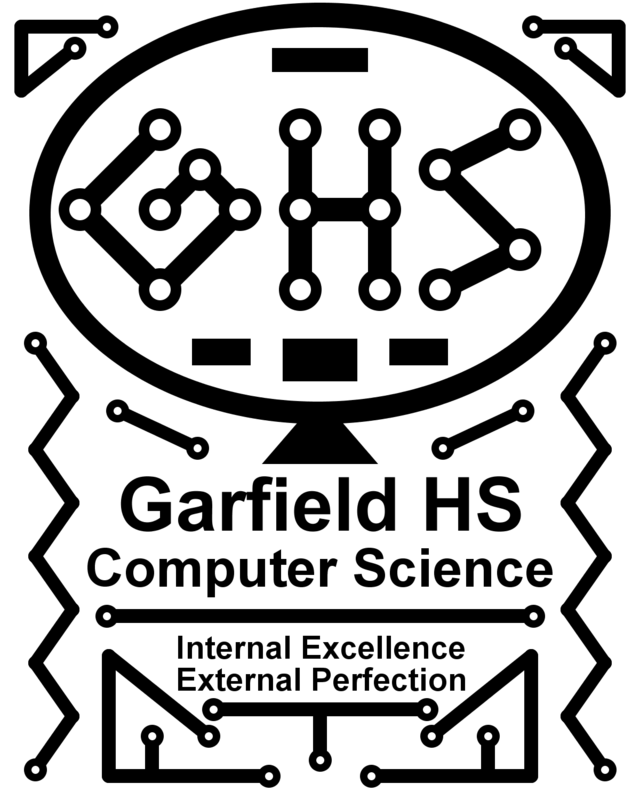 Our Garfield HS Computer Science Linked In Group (we need a logo!) to join you must have graduated and be over 18 years old. Seniors: Please double check your Grades in the Source. And... Please fill out our AP CS 2014-15 Class Survey,especially seniors. Remember, all other Final Project code is due Tuesday, June 9th, and presentations are Tuesday, June 10th. See above and Sign yearbooks. Karaoke OR work on your Final Project. Last day for classwork sign off's. Monday Lunch (about noon) stop by 115a for our CS Class X-Box One Raffle, you need not be present to win. NOTE: Winners will not be able to take the prize home till we have contacted their parent. Try out other (seniors') team's code - give them feedback. We have some great projects here. 2) What did you learn from creating this project this? Anything new things about programming or Java libraries? 3) What was the most challenging part of the project? 4) How well did you abide by our coding conventions? Did you all add comments?? 4) For teams, how did you divide up the work and integrate it? - Return textbooks if you have them please! 1) Make sure you have internally good code i.e. comments, indentation, naming conventions. + UW in HS Survey for those who did that program. + Late Day Points are Posted in the Source, Check how I applied them! Seniors: Complete your: Final Project and save code (see left) today, demos on Thursday, June 4th. Others you have till next Tuesday to turn in code, June 9th - demo's on Thursday, June 11th. 3) Compile the code in that folder (using JGrasp please) and make sure that it runs fine - you will be executing from here for the demo's on Thursday, 6/4. + Late Day Points are Posted in the Source, let me know how you want to apply them! One Question: Please Take This Survey to help our AP History class gain perspective. Big data in action here. 3) Compile the code in that folder (using JGrasp please) and make sure that it runs fine - you will be executing from here for the demo's. 4) Let Mr. Bergquist know that you have everything in place ready for grading & demo's. Keep in mind I will be reviewing running & reviewing that code for grading. Determine how you want to use your extra Late days, check out the source and talk to Mr. Bergquist. It's Late Start/EOC Week: The CS Lab will be open for school work and help (no games or videos), Wednesday - Friday 8-11am. Stop by. Teams will be working on PACC on Wednesday morning. - See bottom of our AP CS Final Project page. Then start work on them! - Project Proposal - save a copy in our class folder: My Computer > S: > embergquist > Writeable > AP CS > Period 4 or 6 > DUE TODAY. Just in case: Snake Project (SnakeGameTest.java) I have scores for the UW in HS Exams but not class final grade - further details on the final and UW in HS Scoring can be found here. Update: turned the Application for the Summer Skill Center Program (has full details) to Me and I will pass it on to Counseling. Talk to me for help. Forms are due by May 29th, but get them in as soon as possible, classes fill up. We will also have an update on the Lab being open during Testing today. Create your Project Proposal - save a copy in our class folder on the S: Student Folder Drive. We will have a paper check and drawing 10 minutes before class ends today. Complete: GridWorld classwork, listed below... Raffle ticket for all team members who have turned in your Project Proposal I will be checking to see if you have saved a copy in our class folder. User Centered Design Workshop Today with UW HCDE Grad Students. User Centered Design Workshop Today with UW HCDE Grad Students. How does this relate to your Final Project Proposal? - Project Proposal Due Monday, but if you have it in by Friday 15th, you earn one XBox One Raffle Ticket! - Snake Project is due next class after Tue, May 19th. + User Centered Design Workshop, Thursday, May 14th with UW HCDE Grad Students. - Tuesday, May 5th last day for full points on Jumper classwork. Please get your PACC Permission Slips in. Thanks! FYI: Stephen Hawking on AI - an Existential Risk User Centered Design Workshop next Thursday with Grad Students! - Project Proposal Due in a week, better to get them in earlier! + CodeDay is Saturday noon to Sunday Noon, May 23 & 24 & Tickets are Available - good chance to meet others who are interested in coding projects. + Girls Who Code has COVERGIRL Apps Challenge where pairs could win a Scholarship and make-up! Video - talk to Mr. Bergquist if you are interested. Both are NOT an SPS/Garfield HS overseen activities. Mock AP Grading Revealed - stick around for details. AP Exam in the Morning AP Exam Day! - Snake Project is due Tue, May 19th. A few students will be taking the UW in HS test today. So after attendance move into the lab. Last day* for full points on Jumper. Be ready to demonstrate how it meets all the requirements. *unless you were out. Talk to Mr. B. BEST OF LUCK ON THE AP Computer Science EXAM!! - Snake Project is due Tue, May 19th. Resources for the AP & UW in HS Exams (at the bottom) & our Schedule - Dates Updated! Reminder: If you have not already taken it, the UW in HS Final Exam will be Thursday (7th) or talk to Mr. Bergquist. Thanks. - Try some Previous FRQ problems & their Grading Criteria, most with solutions! it should be "if (1 < x && x < 10)"
More Resources for the AP & UW in HS Exams (at the bottom) & our Schedule! APCS & UW in HS Review Day and Ice Cream Social, May 2nd at UW! remember to register. AP CS Final (Mock AP) Multiple Choice exam with only Quick Reference for 2013 Exam includes GridWorld code. AP CS Exam takers: Don't forget to solve the GridWorld FRQ Take Home problem due Friday, May 1st. Complete the AP GridWorld Mock AP Exam Problem: Due Friday (or Thursday for anyone out on Friday) during class. Take a copy of the AP GridWorld Mock AP Exam Problem: Due Friday during class. Please sit with one computer between each other when working today to insure your own work on the GridWorld AP Problem. Need help reviewing? I hope to have some previous AP Student available after school, talk to me. - Specific areas or topics? ** Please make sure you fill out our Final Exam/Shopping Cart Survey today. - Jumper AND all Bugs signed off by Monday, 4/27 (note you must be prepared to demonstrate how to test it). Note Object it in the 2014 AP CS Java Quick Reference! Please make sure you fill out our Final Exam/Shopping Cart Survey today. + Raffle Ticket Deadline Monday 4/27 (updated) for: Jumper (from GridWorld, part 3). - Gridworld, part 4: Do Part 4's Exercises: 1, 2, & 3 OR KingCrab Critter notes / Gridworld API due Mon, May 4th. - Start on Snake Project. AP CS Review Day & Ice Cream Social, Saturday, May 2, 2015 1-4pm at UW Paul G. Allen Center for Computer Science & Engineering - register to attend. Ticket Warm Up! - At least 10 MC Practice problems correct - group grading on Thursday. Extra copies on lab table. Prizes for top scores. Ask him about his experience in Technology. Readings in BJP Lecture Thursday. - Get working on Jumper be ready with your test to swiftly demonstrate all traits with your partner. Preview Snake - Due after the AP Exam. Mr. Bergquist will be out the Monday & Tuesday after break. You will have 2 topics to read about and try; see the bottom of our Class Plan for full details. (Block) Quiz on Classes, Binary, Arrays and ArrayLists. Then Extend a Class in GridWorld to create a Jumper. 3) Work on: Jumper in GridWorld, part 3 with your partner. + Pick up a Sample MC Test if you are not going to be in class on Friday. Complete it over break to win Prizes! Preview: Snake Project for after break. Tuesday 4/7 Extend a Class in GridWorld to create a Jumper. Sign off's on SpiralBug, ZBug and DancingBug from the second part of the GridWorld case study. You should be now working with a partner on: Jumper with a partner. - register to attend. Binary Warm Up! + A Practice AP CS Multiple Choice test will be given to you on Friday - solutions & Prizes when we get back. + Previous Free Response questions requires your AP Login. Monday 4/6 Extend a Class in GridWorld to create a Jumper. Complete SpiralBug, ZBug and DancingBug checked off from the second part of the GridWorld case study. Start Part 3 Exercise: Jumper with a partner. JumperStart.java top part of the Jumper object to get you started. Work on Part 3 Exercise: Jumper with a partner - create clear test plan to demonstrate it is fully working. Study Review for upcoming Quiz on ArrayLists, classes, Binary & Arrays - Thur April 9. You may also want to reference the Supplemental Videos if you missed lectures. Friday 4/3 Create new Bug Actors in GridWorld using Inheritance. Complete and get SpiralBug, ZBug and DancingBug checked off from the second part of the GridWorld case study. + Continue on to pair* with another student to Part 3 Exercise: Jumper (from GridWorld, part 3). JumperStart.java top part of the Jumper object to get you started. Complete SpiralBug, ZBug and DancingBug in second part of case study. Quiz next Thursday (42 points): Binary, Array Mystery, ArrayList Simulation, Reading Classes, ArrayList Program & Class Creation. 4/2 (Block) Follow Inheritance and interact with SuperClasses. Set up the GridWorld Case Study, build your first bug! Make sure to get GridWorld running in your Work Space TODAY. Get Sign off On: Weight class lab practice. Due today. Then Work on SpiralBug, ZBug and DancingBug in GW, part 2 of case study. Demonstrate them as a single runner. Set up GridWorld in your APCS workspace & JGrasp. - Now Do SpiralBug, ZBug and DancingBug in GW, part 2 of case study. Use a single runner to test. - you can find the actual code in the Gridworld Folder at: Gridworld/GridWorldCode/framework/info/gridworld/actor BUT do NOT alter this code! Tuesday 3/31 Define your Objects Sort Order in Lists using the Comparable interface and compareTo method. Get Sign off On: Weight class lab practice. For Thursday, Read the first part of the GridWorld case study, and you can continue with GW, part 2. We will start building SpiralBug, ZBug and DancingBug on Thursday. Monday 3/30 Define your Objects Sort Order in Lists using the Comparable interface and compareTo method. Done? Start to Set up GridWorld in your APCS workspace & JGrasp. Make sure to register for the Programming Contest. deadline today! Thursday 3/26 Create a common Interface for Objects. + Paul Allen Computing Challenge (PACC) - Part I deadline extended to Sunday night March 29th. + Registration for the Spring Programming Contest (Sat April 25th at LCM) is open Today at 3pm! Let me know if you form a team. What was important about Interfaces?? Comparable & compareTo Method: making your Objects Sort Order! Try them out creating the Weight class with a Comparable Interface lab practice. It's in the 2014 AP CS Java Quick Reference! Any last questions on: Project 8: Shopping Cart? Make sure to privatize all your fields and comment your methods. Tuesday 3/24 & Wednesday 3/25 (35 min class) Build a collection of Object Classes using ArrayLists to create a functioning project. Complete your Project 8: Shopping Cart - includes 4 Objects plus your ShoppingTest.java that fully exercises your test methods. [Turn code files in here] Due Thurs 3/26. Last day for full credit: ArrayList Practice - have it ready in Practice-It - Thanks. Done? Try these Interview-style brainteasers We will do Comparable lecture on Thursday, OK? Monday 3/23 Build a collection of Object Classes using ArrayLists to create a functioning project. Last Signs off for the ArrayList Practice (PDF version) (Car & Student should be done by now) - late after this week. Work on Project 8: Shopping Cart (PDF Version) Due Thur, March 26th. - 10.2 The Comprable Interface (compareTo): pp 646 - 658 Warm Up: What fields & methods do you think every Product is required to have at Amazon.com? Any questions about using Object Oriented Design for the Shopping Cart Projector in general about the Project 8: Shopping Cart. - Registration for the Spring Programming Contest (Sat April 25th at LCM) is open Today at 3pm! Let me know if you form a team. - Paul Allen Computing Challenge Part I is due by this Friday. Please et me know how your team is doing. Friday 3/20 - Short Period. How is data represented in a Computer & the Internet? Binary & Hex number systems. - 10.2 The Comparable Interface (compareTo): pp 646 - 658 Binary & Hex in 25 minutes! Warm up - 1st page: Binary & Hex Worksheet get started! Reminder: Registration for the Spring Programming Contest (Sat April 25th at LCM) will open Monday , plan on forming a team. Make sure to register your team next week. Block Day! Build a collection of Object Classes using ArrayLists to create a functioning project. Work on Project 8: Shopping Cart - due Thursday 3/26. - 10.2 The Comparable Interface (compareTo): pp 646 - 658 Testing Considerations (Warm up): What's the Pattern & the Scientific/Testing Method - What quantities should you use to test your Item object? Monday 3/16 Build a collection of Object Classes using ArrayLists to create a functioning project. Registration for the Spring Programming Contest (Sat April 25th at LCM) will open next Monday (23rd), plan on forming a team. And check in with me about the PACC, we can work on that during HSPE or after school. ArrayListFun.java Sample Solution from last week's Class demo's. Good examples to use for the ArralList problems. It's HSPE testing week NOTE: The CS Lab will be open during morning HSPE testing Tuesday & Wed (7:50-10:30am) to work & get help on class work & projects (no games please). Mr. Bergquist will be available for help too! Can meet to work on PACC too! Tomorrow is Pi Day! Create ArrayLists and use their methods to solve problems. - Continue work on the ArrayList Practice (PDF version) final day for sign off Fri 3/20. + Check the Source for your 5 week grade going out later this week. Next Week: CS Lab will be open 8-10:30am Tues & Wed during the HSPE testing for school work (no games or horsing round). Good chance to catch up on classwork and get started on Shopping Cart! Thur 3/12 Assessment on Arrays & Logic. and sign in with your full email and password, it should then display. Tuesday 3/10 Create ArrayLists and use their methods to solve problems. Note: the Java Syntax Sheet above is updated to include ArrayLists. Reminder: Arrays Quiz (Array Mysteries, Boolean Zen logic and Array Programs) - Thursday! Monday 3/9 Build robust Object Classes, demonstrating constructors, encapsulation, and exceptions. Quiz (Array Mysteries, Boolean Zen logic and Array Programs) Thursday! Friday 3/6 Build robust Object Classes, demonstrating constructors, encapsulation, and exceptions. Sign off on Car and Student Objects: Creating the Car & Student Object Classes Practice - last day for sign off is Monday for full credit, and we will be starting ArrayLists too. Thursday 3/5 Build robust Object Classes, demonstrating constructors, encapsulation, and exceptions. Continue work today on Car and Student Objects: Creating the Car & Student Object Classes Practice - last day for sign off is Monday for full credit, and we will be starting ArrayLists on Monday. Solution to Point with Encapsulation, toString & using ''this' keyword. Quiz Next Thursday on Boolean Logic & Arrays! Tuesday 3/3 Build robust Object Classes, demonstrating constructors, encapsulation, and exceptions. NOTE: Arrays Quiz (Array Mysteries, Boolean Zen logic and Array Programs, including 2D!) - Next Week. Monday 3/2 Encapsulate fields in an Object, add a ToString method and use "this" keyword. Create Arrays of Objects & add Exceptions. - 2D Array ASCII image processing - run both the Homer & Mystery files. - The "Epicenter" solution using your Point Object (at the bottom of the Your Own Point Object Class sheet. Encapsulate fields in an Object, add a ToString method and use "this" keyword. Create Arrays of Objects & add Exceptions. - The "Epicenter" solution using Your Own Point Object Class(instructions at bottom). Create an the Point Object class and use it to solve the Epicenter problem. 2) Build the the "Epicenter" solution using your Point Object - at the bottom of the Your Own Point Object Class sheet. Tuesday 2/24 Create an the Point Object class and use it to solve the Epicenter problem. Then Build the the "Epicenter" solution using your Point Object (at the bottom of the Your Own Point Object Class sheet. Monday 2/23 Create an Object class with State (fields) & Behavior (methods) and add its Constructor for initialization. Complete our DNA project Survey today please. Lunch Event today in our classroom to meet some industry professionals in technology - bring your lunch and join us! Short day Using 2D Arrays and your first Object! - Complete 2D Array ASCII image processing worksheet. Please finish for Monday. - AP Exam Details - make sure to register. - Details available for the PACC: Bioinformatics & Sports Analytics Challenge - Register today if interested. + Let's review the 2D Array ASCII image processing worksheet. Hint look at the last slide of our 2D Arrays presentation. Please finish for Monday. + Done? Start creating Your Own Point Object Class - we will start this together on Monday. Object Create an Object class with State (fields) & Behavior (methods) and add its Constructor for initialization. Finish up 2D Array ASCII image processing worksheet. Do as homework. Still missing some DNA project - Turn In Project Here. - Due Last week. Once done, we will start creating Your Own Point Object Class together in lab. Introducing the Object Class! We will go over most of this chapters material eventually. Wednesday the 18th!) Store information in 2D Arrays and create methods to display & manipulate them. Then Start 2D Array ASCII image processing worksheet. Work on the DNA project (Turn In Project Here.) Due Thursday, 12th Feb.
(A few DNA Structured Diagrams should be complete & ready for sign off) PACC: Bioinformatics & Sports Analytics Challenge - Register to get the full details. DNA project Was due Thursday, Feb 12th. Technology Vision Town Hall Meetings! SPS wants your feedback on the technology we need! Tuesday 2/10 Use Arrays and Structural Decomposition to solve the DNA project. Next: 2D Arrays Thursday. Questions on DNA project? Make sure to have proper Class Constants, Structured Diagram is due today, project due Thursday. Shall we talk a little about Writing to files for the DNA Project (see if you can figure this out from the API & these instructions). For more details read BJP: Section 6.4 Advanced File Processing, page 401 - 409. Monday 2/9 Use Assertions to better understand how your code will execute. - 7.5 Multi-Dimensional Arrays: pp 473 - 479 - later this week. Questions on DNA project? Make sure to have proper Class Constants, Structured Diagram is due today, project due Thursday. Do this with a partner after you have the Structured Diagram for the DNA project signed off, then get back to the DNA project. Thanks. Friday 2/6 Boolean Zen, Short Circuits, & DeMorgans Law. Sign Off on Structured Diagram for the DNA project - Due by Monday 9th Feb - you should be done by now. Monday we will look at how to save a double with only one decimal place correctly. Solution for Project 6: Baby Names. Let's Diagram it. Questions on the DNA project? Block Structure Diagraming & Java API for file output. Make sure your 1st Semester grades look good in the Source if you have missing sign offs, it's your job to get them to me - partial credit is available. - Work on the DNA project Due Thursday Feb 12th (before Break). NOTE: Friday Lecture: Booleans & DeMorgan's Law & Assertions (Reading list below) Why do Structured Diagrams? - Go check your grades in the source let me know of any discrepancies. - if you have missing sign offs, it's your job to get them to me - partial credit is available. - let me know any discrepancies immediately. + REAL TALK in celebration of Black History Month lunch presentations in the Career Center throughout the month, check the schedule. Approach structuring your methods for a project by creating a Structure Diagram. First Create your Structured Diagram for the DNA project, Due by Monday 9th Feb.
Work on the DNA project Due Thursday Feb 12th (before Break). - How did you accomplish previous projects? - What determined the methods you created? - What was key to solving the problem when work was being done by several methods? + 2015 Engineering in Sports Essay Contest: First Place $500, deadline March 1, 2015 at 6:00 pm EST (3pm PST). Use the Java API to find coding methods & syntax (for file output). + Alternate Arrays Lab from UW CSE 142 page with list of scored problems! If you still need sign off, see me after school (last day Wed 2.2) before OR Wednesday morning - , lab will be open 7:50 - 10:30am during EOC testing What's next? The Future with Holograms Video - what do you think? Optional: Applying CS to help Scientists Seeing DNA. Learn by Reading - File output: Check out the Java API to figure out how to accomplish the Writing to files for the DNA Project (see if you can figure this out from the API & instructions above). For more details read BJP: Section 6.4 Advanced File Processing, page 401 - 409. - WA Senior ACPE $2500 scholarship for a CS Project. Requires a webpage showing your project, online application due before 5pm, February 15, 2015. - Summer 2015 Opportunities from Microsoft & Google for high school students. - check the due dates. Work on the DNA project Due Thursday Feb 13th (before Break). - Grading will be based on the AP Exam Grading scale with approximately a 5 - mid 4 = A, 4 - mid 3 = B, 3 - mid 2 = C, low 2 - 1 = D/E. I will be around after school for last minuter sign off's and help. Try these Boolean Multiple Choice Problems - good review of logic and doing MC problems. Gives correct answers and reason if you fail. Booleans & DeMorgan's Law presentation can make later one's easier. Or start the all the DNA project, will be due second week of February. Lab Day for final sign offs! NOTE: There are 3 Multiple Choice Problems using Arrays, no programs to write. - Exchange papers and discuss results. Both of these sheets are Due by Friday, 24th January. Due Today: Corrections on Quiz for ReGrade - 50% points gained with max of 18/22. - Microsoft Interships, summer 2015 - due 28th Feb.
- The Washington State Opportunity Scholarship (WSOS) supports low- and middle-income students pursuing eligible high-demand majors in science, technology, engineering, math (STEM) or health care. Can earn up to $22,500! Applications due March 2nd (5pm). Microsoft Interships, summer 2015 - due 28th Feb. Anyone going to the PLU Programming Contest - Sat, Feb 7th; please tell Mr. Bergquist. These are Due by Friday, 23rd Jan along with all other classwork. - Details & Course Description 2014 (Exam details page 18) Don't try these samples yet..
- Quick Reference from last year, no GridWorld this year. Quiz Corrections for ReGrade are due by Thursday, 22nd Jan - 50% points gained with max of 18/22. Late on your Projects? Review our AP CS Syllabus, with guidelines for late projects. GET THEM IN! 1/12 & 13 shorter periods Manipulating the values of Arrays to solve problems accessing them "by Reference"
1/11 Manipulating the values of Arrays to solve problems accessing them "by Reference"
Please make sure to fill out our Baby Names Project & Class Survey today. + TECH Out! Saturday, February 7, 2015 Registration Opens today at 3pm - for girls interested in computer science & technology, sponsored by Amazon.com & PSCSTA at UW. Spread the word. Work on Array Practice Sheet (first) - review Arrays as Parameters before starting. Alternative: CSE 142 Arrays Lab - let's discuss. - Sign off on Reading Data From A File Practice Problems last day for full points is Friday. + TECH Out! Saturday, February 7, 2015 - for girls interested in computer science & technology, sponsored by Amazon.com & PSCSTA at UW. Spread the word. Sign off on Reading Data From A File Practice Problems last day for full points is Friday. Before you turn in Baby Names go over the Checklist for the Baby Names Project! Done: Try some of the PLU Programming Contest 2014 Practice Problems Checklist for the Baby Names Project - please review it carefully. Thursday: Quiz for students who missed it before break. NOTE:Thur: Quiz for students who missed it last year after presentation Arrays presentation. BONUS: Checklist for the Baby Names Project - please review it carefully. Shall we solve finding the line based on the input name? - Project 6: Baby Names due Thursday 1/8/2013. - if you are behind, please catch up over break please. Any Questions on: Project 6: Baby Names?? Introducing the Paul Allen Computing Challenge (PACC), check it out. More on it when we get back. (Block) Assess knowledge of String Methods, while loops & logic. - Last chance full credit sign off for: Strings & Fence Post / While problems. use: Updated Java Syntax Sheet! Here's our Mayor Murray visits Garfield HS for the Hour of Code post! - Several Methods that Return values - a couple return strings! Project 5: Creative Name Generator. Instructions at right. - Discuss the project code: ask questions about their approach, highlight good points, and point out suggest improvements. 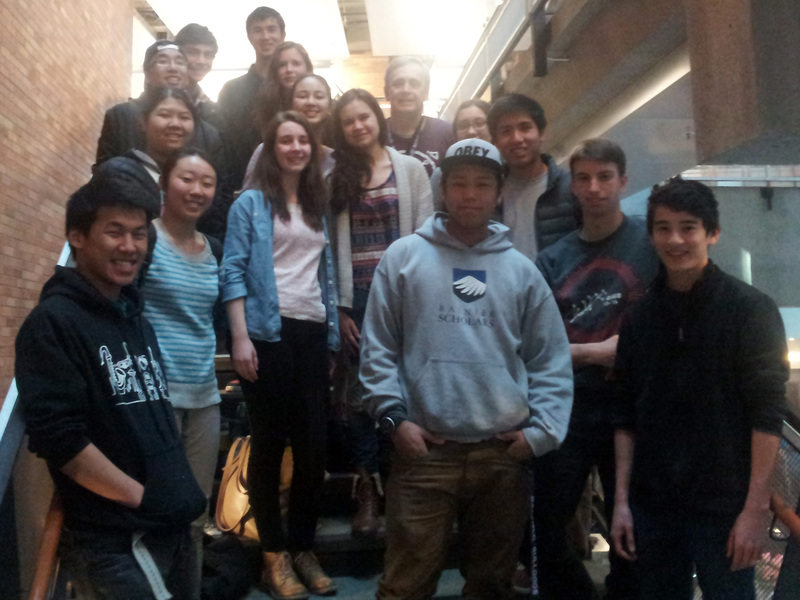 - Garfield Dawgbotics ranks 1st in League Robotics Competition! - Start your review for quiz (12/19). - Start Project 6: Baby Names Due Tuesday, Jan 6th make sure to get a good start before break, you will only have a couple days after it. Questions? Project 6: Baby Names Please read it carefully. Due after break. Get ready for the Programming Contest at UW Saturday. - Make sure you work out details on computers and adding the API. Let me know if you want to go over it with an example. NOTE: Review for quiz (12/18) on your own. Work on Reading Data From A File Practice Problems You should have done the Starter problem (2.1) already. Friday, last day for sign off for Fence Post & While Loop Practice problems. Make sure your Project 5: Creative Name Generator is turn it in here. (Peer grading delayed but due today). + Please fill out this online Exit Ticket on While loops, Fence-posts and previous topics at end of period. - Last day for sign off for full credit on Strings Lab Practice - Pig Latin & Caesar Cipher. Later in the week sign off for Fence Post & While Loop Practice problems. - Copy this on your PC and extract the zip there - it expands to 264Mb. The Java 7 API is found at docs/api/index.html, just open it in a browser - it will not require internet connection. Handout: File Input with Scanners (updated!) We are going to Peer Grading of Project 5: Creative Name Generator later, please make sure to turn it in here. (it is still due today). I'll explain. Please make sure you have filled out our online Exit Ticket on While loops, Fence-posts and previous topics by end of period. - Tuesday 4th Period and during lunch (and 4th period) we will host two Tableau engineers to talk about working in the industry Join us for lunch & conversation. - Quiz on Thursday Dec 18th, this Quiz Practice is highly encouraged. Friday 12/5 Using Fencepost solutions, while loops, and pseudo-random numbers to create a Project 5: Creative Name Generator. - Turn it in here. Must be in for Monday's Peer grading, see me if you are not going to be complete. - Fence Post & While Loop Practice problems. + Please fill out this online Exit Ticket on While loops, Fence-posts and previous topics at end of period. Finish up your Project Day! - Tuesday during lunch (and 4th period) we will host two Tableau engineers to talk about working in the industry Join us for lunch & conversation. + UW Computer Science Open House 1pm - 5pm on this Saturday, December 6th. Lab work: Using Fencepost solutions, while loops, and pseudo-random numbers to create a Project 5: Creative Name Generator, (DUE Friday). - Complete your Project 5: Creative Name Generator - Turn it in here. Make sure to follow our Project Correctness Checklist. - Console Version: Pr2D1withConsole.java - let's make it read from a file. Tuesday 12/2 Using Fencepost solutions, while loops, and pseudo-random numbers to create a Project 5: Creative Name Generator. Work on Project 5: Creative Name Generator, Turn it in here. Due Friday, Dec 5th - we will peer grade on Monday so make sure it is turned in. - The AP CS Class Plan has been updated through first week January. - Lecture on Thursday: File input with Scanner please be attentive. - UW Computer Science Open House 1pm - 5pm on Saturday, December 6th. Monday 12/1 Formatting printed numbers - printf. Using Fencepost solutions, while loops, and pseudo-random numbers to create a Project 5: Creative Name Generator. - You should start the Fence Post & While Loop Practice to make sure you can get the Sentinel while loop in place. Work on Project 5: Creative Name Generator, (due Friday 5th Dec for grading during class). Turn it in here. Line-based file input Questions on Project 5: Creative Name Generator? Due Friday 5th Dec.
How do we get only 2 decimal places to display for currency? - Can we do it with Math.round()? Please turn in your Programming Contest Permission Slips to Mr. Bergquist today (noon Tuesday at the latest)! Also don't forget payment is due. Happy Thanksgiving! Fencepost conditions & solutions, using while loops, and creating pseudo-random numbers. + Please fill out this online Exit Ticket on Strings and previous topics at end of period. - Finish up: Strings Lab Practice - sign off. Line-based file input Questions on Project 5: Creative Name Generator? Done? Start on Project 5: Creative Name Generator (due Next Week - with Peer Grading) Let me know if you are unclear on any of the instructions here. Introducing Project 5: Creative Name Generator (due Next Week - with Peer Grading) Let me know if you are unclear on any of the instructions here. Monday 11/25 Using String methods & the char type to solve text problems. Using Fencepost solutions & while loops. Start Fence Post & While Loop Practice - 2 Practice It! 's and a third optional warm up problem. Preview Project 5: Creative Name Generator (due Next Week - with Peer Grading) Let me know if you are unclear on any of the instructions here. Table Groups: Write a Method that prints out the factors of a number. + See Mr. Bergquist if you need any clarity on our new String Methods and using the char type. Last call on the Programing Competition registration (deadline was extended till Tuesday night.) Warm Up: What would this code do? What are you interested in for Computer Science Week (Dec 7-13)? What kind of speaker would you like?? Any professionals you know of?
! !Last Day for sign up for the Programing Competition Sat, Dec 13th. Register today!! If your project is going to be late, please talk to Mr. Bergquist. Please make sure you have filled out our Exit Ticket on Parameters & Graphics Thanks. 11/13 Using Returns, Conditionals (if/else) & Cumulative Algorithms to solve problems: Birthday and introducing Strings! 1) Please make sure you have filled out our Exit Ticket on Parameters & Graphics Thanks. PUBLIC SERVICE ANNOUNCEMENT: I often find errors in Project 4: Birthday's output - there are several (3-4) different message combination. So Double check punctuation, new lines, and the introduction carefully; better yet use Quick Diff to compare with the examples! - Quiz 2 Graded! - Loop activity next week to help with redo's. - Any individuals need a team for the Programming Contest, Saturday Dec 13th! - get registered - we can add people later. It's a blast!! GangstaNameStart.java . (likely for Monday). Then work on: Project 4: Birthday Due Friday Nov 15th. - Reading the main method clearly shows what the program does - use methods to do the actual work. - Follow our Coding Conventions including naming variables well and adding comments for read-ability. Programming Contest at UW, Saturday Dec 13th, registration opens today at 3pm Form a team of 3 with Classmates. Cost: $30, scholarships available. Then work on: Project 4: Birthday Due Friday Nov 14th. Review Style Guidelines for: Project 4: Birthday Due Friday Nov 14th. Novice or Advanced?? Programming Contest at UW, Saturday Dec 13th, registration opens on Monday, 11/10 at 3pm Form a team of 3 with Classmates. Cost: $30, scholarships available. - Then Start: Project 4: Birthday Due Friday Nov 15th. Q&A: Project 4: Birthday Due Friday Nov 14th. .
MORE DETAILS: Programming Contest at UW, Saturday Dec 13th, registration opens on Monday, 11/10 - be ready!! Form a team of 3 with Classmates. Cost: $30, scholarships available. Bring up the Math & Scanners Lab for sign off please. Preview: Project 4: Birthday Due Friday Nov 14th. Advanced If Returns & Cumulative Sum. ANNOUNCING: Programming Contest at UW, Saturday Dec 13th, registration opens on Monday, 11/10 - be ready!! Form a team of 3 with Classmates. More details on Thursday! End of the Quarter is Friday. Check the Source & make sure all your Lab worksheets are complete through all the Grapics and the Math & Scanners Lab Worksheet, which I will be signing off today (Graphics after today are late). * For those who missed the Quiz last Thursday, it will be given second hour of this Thursday or make arrangements with me. Happy Halloween Assess your use of Parameters, Graphics & Math methods. Make sure to finish up all past worksheets including the Math & Scanners Lab. Trick or Treat: Your Doodles from Cafe Wall!! - UW in the HS - TOMORROW Friday, 31st October. - NCWIT: Aspirations in Computing - Sun Nov 2nd. Complete:Math & Scanners Lab Worksheet sign off on Thursday. Make sure you have done these Readings in BJP for Monday. Open note & open book Quiz on Thursday: Loops, Parameters, Graphics, & Math methods (with Expressions). Should I include find the errors problem? - UW in the HS registration deadline is THIS Friday, 31st October. See me if you need a form. Tuesday 10/28 Using Math Methods to make calculations and Scanners for gathering input. Readings in BJP for Monday - make sure you have read it. Monday 10/27 Using Math Methods to make calculations and Scanners for gathering input. Complete the Quiz Practice Homework Assignment for grading tomorrow. Parameter & Graphics Review: warm up. Friday 10/24 Using Math Methods to make calculations and Scanners for gathering input. - UW in the HS registration deadline is next Friday, 31st October. See me if you need a form. Next Quiz Oct 30th on: Parameters, Graphics, Loops, & Math Returns (no Scanners). Open Book & Notes. Quiz Practice Homework Assignment - complete to be scored in class on Tuesday, 28th October. Block Using Math Methods to make calculations and Scanners for gathering input. Tuesday 10/21 Creating scalable graphics using for loops & parameters. If you receive a Project Late form, please complete it right away. Thanks. Monday 10/20 Creating scalable graphics using for loops & parameters. Exit Ticket on Parameters & Graphics - Please complete today. Programming Contest T-Shirt Design Contest too!! See full details linked here Time to work On Project 3: Café Wall Any Questions?? Any one have an area you want me to go over again? I can do it for many students in the classroom now or tomorrow. Done? Get your name on our Garfield CS T-Shirt! Work, perhaps with a friend create a T-Shirt Design for this year! BE CREATIVE!! Show me what you have in mind. Friday 10/17 Creating scalable graphics using for loops. Continued lab work & sign off on worksheets & problems listed below (see Thursday). Start work on Project 3: Café Wall Due Thurs 23rd Oct. If done early, try additional Chapter 3 and 3G problems in Practice It! See if you can get a high score. (Short Block) Creating scalable graphics using for loops. Review: Project 3: Café Wall, due Thur 23rd Oct. Scale the Car from slide 6 of Graphics Part 2, with starter code: ScaleTheCar.java. Random Pick? Tuesday 10/14 Creating graphics using for loops. If you have difficulty accessing Practice It, use this Graphics with Parameters Worksheet page (copy of the problems). Monday 10/13 Using Objects: Use Methods of the Graphics Object to create cool images within the DrawingPanel. 2) Create your: Starting Graphics Drawings. Feel free to try using loops from our Graphics presentation in your drawings! - You can later use this for your "Doodle" part of the next Project! 3) In Practice It! from UW, solve BJP3 Self-Check 3.6: parameterMysteryNumbers - please show it to me with your Drawing for sign off. Create your Starting Graphics Drawings. Feel free to try using loops from our Graphics presentation in your drawings! This Graphics Loops Note sheet may help. Block Creating graphics with DrawingPanel. - Check your grade in Source make sure all are signed off and your SpaceNeedle Program is marked as "Collected". - Complete Parameter Practice Lab Worksheet 1-3 first priority (for sign off), then try the rest. Should finish up today. 2) Make sure to select Garfield High School, so you can see and show up for our high scores. 3) Try it - Solve Self-Check 3.6: parameterMysteryNumbers to confirm it works for you - I will check this later with your Graphics Drawing. DrawingPanel.java Must be copied to your Java code folder/directory, DO IT TODAY! NCWIT Aspirations in Technology competition - all women in CS should consider applying. CODEDAY Seattle is coming Nov 8 - 9th, noon to noon. Register Early & Save. Extra Verses from the Song Rap to enjoy. Tuesday 10/7 Using Parameters & obeying Scope. 3) Continue work on on Parameter Practice Lab Worksheet 1-3 first priority (for sign off), then try the rest. In groups, at your Table solve 1) & 2) of the Parameter Mystery Worksheet on back of Note Handout: Parameters. After you have seen your Project 1 Scoring please fill out our: First Two Projects Check in survey. Thanks! 5 weeks Basics of Parameters. Please create an account in : Practice It! from UW and do the exercises for Chapter 1-3. Try To get the HIGH SCORE. (for Monday) Note Handout: Parameters with Parameter Mystery Worksheet (back). - Turn in Class Contact & Contract Signature sheet. - UW in the HS registration deadline is next Friday, 31st October. Thur 10/2 (Block) Assess your knowledge of Expression, Variables, Methods & for Loops. Done? Try some Practice It! Problems and see Monday's list of suggestions. Quiz Today covers: Println, Method calls, Expressions, basic loops and Nested Loops. Then finish up Project 2: Space Needle in the lab, due TODAY, 2nd Oct.
Tuesday 9/30 Using nested loops & Class Constants to draw Complex Scalable images. Done? See yesterdays list of suggestions. And don't forget our Quiz on Thursday. Monday 9/29 Using nested loops & Class Constants to draw Complex Scalable images. - Creating an account in : Practice It! from UW and do the exercises for Chapter 2 & 1. Try To get the HIGH SCORE. - Lab 2: Expressions, Variables, and Loops from Building Java Programs. A self-paced lab exercise. Questions on Project 2: Space Needle ? Quiz Block Day Thur (2rd): What's on it Any questions? Using nested loops & Class Constants to draw scalable images. Please fill out our Loops Exit Ticket today. Please set up an account in: Practice It! from UW. See who can get a high score this year!! forms & fees due Friday, 31st October. + Students Sign the Back page of this packet and have parents fill it out too). Includes the UW in HS paperwork. Questions? Project 2: Space Needle Due Thursday 2nd October. Early Dismissal Using nested loops & Class Constants to draw scalable images. Get signed off on: Expressions & Loops Lab Worksheet - should be done, so you have time for the project. Then Start on: Project 2: Space Needle Due Thursday 2nd October. Quick Look: Complex Figure Exercise Can you reverse a loop?? Questions? : Project 2: Space Needle Due Thursday 2nd October. Our first Quiz will be on next week: Tues or Thur? Tuesday 9/23 Using nested loops & Class Constants to draw scalable images. Get checked off on: Expressions & Loops Lab Worksheet - should be done today, so you have time for the project. Introducing: Project 2: Space Needle Due Thursday 2nd October. Monday 9/22 Using nested loops to draw scalable images. - Start the Complex Figure Exercise. Announcing: NCWIT Aspirations in Technology competition - all women in CS should consider applying. Stop by the WIT meetings Monday at Lunch in 107 (Ms. Rubstello's) for more discussion. Spirit Day Use nested loops to draw scalable images. (Block) Using simple for Loops & start to nest them. Complete Expressions & Loops Lab Worksheet . Tuesday 9/16 Solving Expressions in Java & creating Variables types. Monday 9/15 Solving Expressions in Java. 2) Finish: Project 1: Song (10 Points) - (Due Thur, Sept 18th) You will only be able to Turn it in here if you completed our AP CS Class Survey last week, if not take it immediately. Verify your output with Quick Diff. AP CS 2014 Class Plan - our next few weeks! After you have verified it, you can Turn it in here using your email & password. Friday 9/12 Solving Expressions in Java & creating Variables types. + Make sure you have taken our AP CS Class Survey today or you will not be able to turn in your project. NEXT: Expressions & Variables be ready to start on Monday. Details below. - Robotics Kick Off is Monday after school. - Who is interested in a Apps Club. Starting up in October. (Block) Mastering Println & Decomposition using Static Methods. About our Coding Conventions & first Project. 1) Take our AP CS Class Survey please. The Garfield Way - School-wide Expectations. Class Pre-Assessment Puzzles... do your best. Tuesday 9/9 Mastering Println & Decomposition using Static Methods. Monday 9/8 Begin using Println, Comments & Static Methods. 1) Decompose BakeSomeCookies.java into a few static methods to produce the same output. Friday 9/5 Compile and Run your first Java program. Get the Hello.java below running using jGrasp - after ward try adding some more text lines to print out. Set up an AP CS folder in your student H: Documents folder to keep your classwork over the year. Open it in the jGrasp Browser window for ease of use. (note: although at Garfield, this is an independent event) If you are interested see Mr. Bergquist for a a discount code for registration. Thursday 9/4 Understand details about the AP CS class. Get familiar with our Classroom Guidelines. Wednesday 9/3 Welcome to AP CS. Learn what this class is all about. Ed Lazowscka’s presentation on ComputerScience, Global Challenges, andNational Policy (great images and visual insights) AP CS Syllabus (pdf format) - Updated for 2014. * Goal should be preceded by: “Student will be able to…” (AKA SWBAT).